I finally made something from my Foodie To-Do List: Lighter Eggplant Parmesan from Gina's Weight Watchers Recipes! (If you subscribe to the RSS feed, the to-do list is on the right sidebar of the blog). I've been on the prowl for healthier versions of my favorite recipes lately, and Eggplant Parmesan is definitely up there with my all-time faves. This recipe was delicious and very cheesy. I didn't miss the traditional breading on the eggplant at all. I did find it quite time-consuming, especially since I made my own tomato sauce, so this isn't the best recipe if you're in a hurry. If you have the time, though, it's well worth it. I'm also thrilled to say that I'm participating in my first bloggy event! 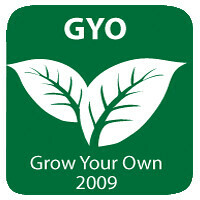 Grow Your Own is pretty self-explanatory: it's a twice-a-month blog roundup that welcomes blog posts that include recipes where the author has grown an ingredient in their garden or foraged it locally. For this eggplant parmesan, I included some of the Italian flat-leaf parsley that I planted recently. This month's Grow Your Own host is House of Annie. Check back there on May 1st to see what the other participants came up with this time around. I hope this is the first of many Grow Your Own and other bloggy events for me! Start by making the sauce. While it simmers, slice the eggplant into 1/4-inch thick slices. 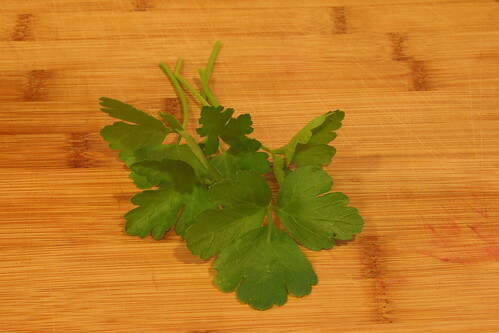 Lightly salt the pieces and put in a colander to release excess moisture for about 1/2 an hour. Pat dry with paper towels. Preheat oven to 450. Brush eggplant lightly on both sides with olive oil and place on cookie sheets (I needed 2). Bake 10 minutes, flip the eggplant over, then bake 10 minutes more until golden brown. Lower oven to 400. While the eggplant is baking, combine ricotta, egg, parsley, and 1/4 c. grated parmesan in a medium bowl. Spread a bit of sauce on the bottom of a 9x12 baking dish. Layer eggplant on top of the sauce. 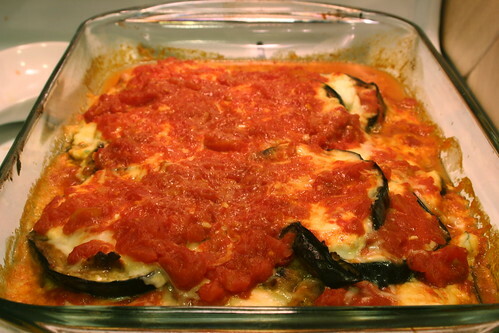 Top eggplant with 1/3 of ricotta mixture and top with mozzerella cheese and more sauce. Add another layer of eggplant and repeat with ricotta, mozzerella, and sauce, then repeat again. Top with more mozzerella and the remaining 2 tbsp. of parmesan. Cover with foil and bake at 400 until cheese is melted and everything is bubbling, about 30 minutes. Remove foil and bake an additional 8-10 minutes. Take it out of the oven and let sit 10 minutes before serving. Enjoy! Looks nice and light. I need more of those kind of recipes!